As fans know, the sport of boxing is absolutely littered with great fighters who, despite announcing their retirement, were simply unable to walk away and stay away for good without making a comeback. Right now, 37 year old future Hall of Famer Miguel Cotto sounds about as convincing as is imaginable when he insists that, yes, his comeback WILL stick; that he will fight no more. Cotto, 46-1(33), goes out with a loss if he does never box again – the loss of course coming to Sadam Ali, who upset the odds to decision to Puerto Rican legend on Saturday night – and some people, Oscar De La Hoya for one, says he wouldn’t be too surprised if Cotto did come back; that Cotto has “an excuse” to fight again should he want to. 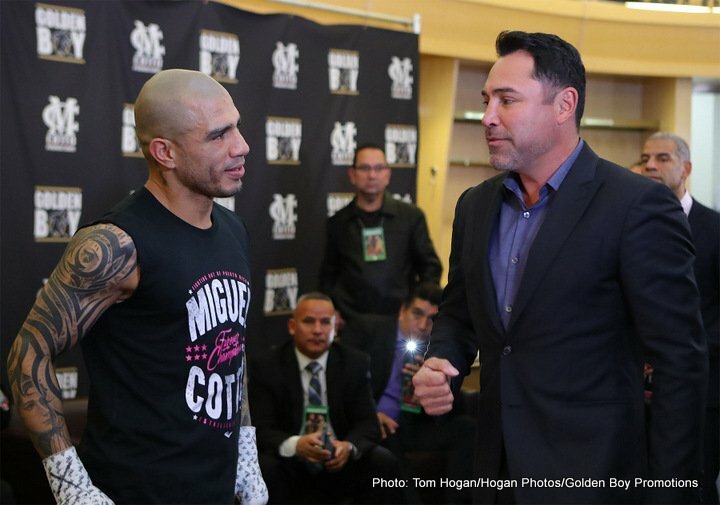 Cotto injured his biceps in the Ali fight, and De La Hoya, speaking with Seconds Out, suggested that Cotto, “once a fighter always a fighter” might wish to do it again. But is Cotto different, is he content whereas De La Hoya, and so many others, were not? Cotto did once declare his intentions to retire at the age of 30, and we all know he carried on well past that milestone. So, as De La Hoya says, who knows for sure? Certainly it would be no shocker if Cotto did return to the ring again – just like all those other great fighters did.